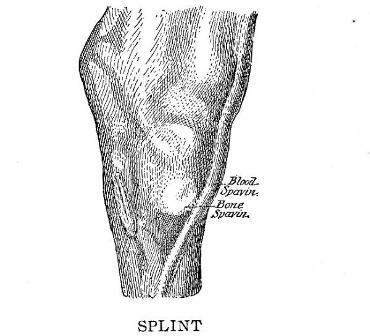 This is similar to bone spavin in its nature, the difference being that the location is within the joint, so that no enlargement is seen, which makes it more difficult to come to a definite conclusion as to its location, and consequently the horse is oftentimes blistered and tormented in nearly all parts of the leg but in the right place. The causes and effects are the same as in bone spavin, and it should be treated in the same way. These cases are often mistaken for hip disease, because no enlargement can be seen. The location of this kind of a spavin is more in front of the hock-joint than that of bone spavin, and it is a soft and yet firm swelling. It does not generally cause lameness. This is similar to bog spavin but more extended, and generally involves the front, inside and outside of the joint, giving it a rounded appearance. The swelling is soft and fluctuating. Young horses and colts, especially if driven or worked hard, are more liable to have this form of spavin than older horses. This is a small, bony enlargement, and generally situated on the inside of the foreleg about three or four inches below the knee joint, and occurs frequently in young horses when they are worked too hard. By this is meant by the sudden shifting of a joint farther than is natural, but not so as to produce dislocation. Every joint is liable to sprain by the horse's falling, slipping, or being overworked. These cases cause a great deal of trouble, oftentimes producing lameness, pain, swelling, tenderness, and an unusual amount of heat in the part. Treatment.-Entire rest should be given the horse, and if the part is found hot, as is usually the case, apply cold water cloths, changing frequently, for from one to three days until the heat has subsided, when apply Kendall's Spavin Cure, twice or three times a day, rubbing well with the hand. If the fever is considerable, it might be well to give fifteen drops of tincture of aconite root, three times a day, for one or two days, while the cold water cloths are being applied. Allow the horse a rest of a few weeks, especially in bad cases, as it is very difficult to cure some of these cases, unless the horse is allowed to rest. A disease of horses, resulting from some lesion of the brain, which causes a loss of control of voluntary motion. As it generally occurs in fat horses which are well fed, those subject to these attacks should not be overfed. The cause is an undue amount of blood flowing to the brain. Treatment- The aim of the treatment should be to remove the cause. In ordinary cases give half a pound of epsom salts, and repeat if necessary to have it physic, and be careful about overfeeding. In mad staggers, it would be well to bleed from the neck in addition to giving the epsom salts.